Fr Sosa told the young people at Magis that they were pilgrims on mission in the same way that St Ignatius himself was a pilgrim. As such, they should take to heart the lessons they were about to learn, the people they were about to meet, and the call they were about to hear. For ten days in January, a thousand young adults embarked on a pilgrimage through Guatemala, Honduras, El Salvador, Costa Rica and Panama. As participants at Magis, the Ignatian program preparing young people to get the most out of World Youth Day,they spent their time among the poor, immersing themselves in different cultures, learning to pray and reflect on their experiences, all while travelling the various roads to WYD in Panama. On Monday 21 January, the Magis event concluded at the church of Colegio San Francisco Javier where pilgrims spent an hour with Fr Arturo Sosa, SJ – Superior General of the Society of Jesus. With young adults from dozens of nations around the world, the pilgrims chose five of their own to voice their experience of Magis (the Latin word for “more”, a favourite term of St Ignatius when encouraging people to go further or deeper). 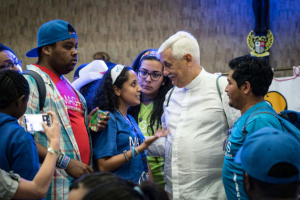 With Fr Sosa listening, they shared stories of uncertainty giving way to understanding, excitement being tempered by humility, fear turning into service of the very people of whom they were previously afraid. Fr General thanked them for their service and honesty during their pilgrimage, then offered them a mission. 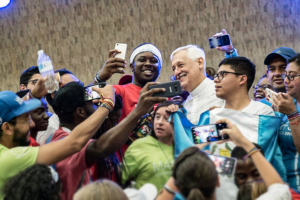 Reflecting on his own experience at the recent Youth Synod in Rome, Fr Sosa offered the pilgrims what he called ‘the 10 signs of the Times’: pivot points that can challenge the life of the Church and contemporary society. One of those signs, how young adults perceive the movement of the Spirit of God through the world, comes about by putting young people in a space where they can dream, the spirit can move, and God can open the heart for compassion. It is in this space that we feel the pain of our brothers and sisters and, emboldened by grace, we can decide to place ourselves at the service of others in the belief that we can make a better world, a better humanity.